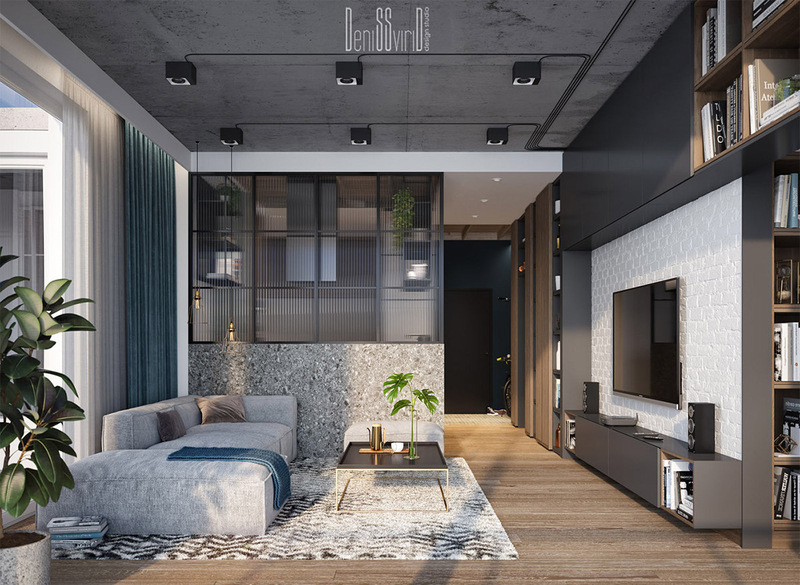 The industrial style loft look carries a cool and trendy aesthetic of exposed brick and raw concrete walls, often with exposed ducting, pipework and electrical wires. 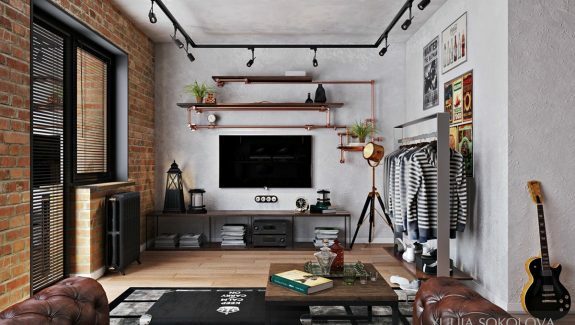 The rough look is now chic for sure, but what about rounding off the edges of that industrial loft look just a tad more? 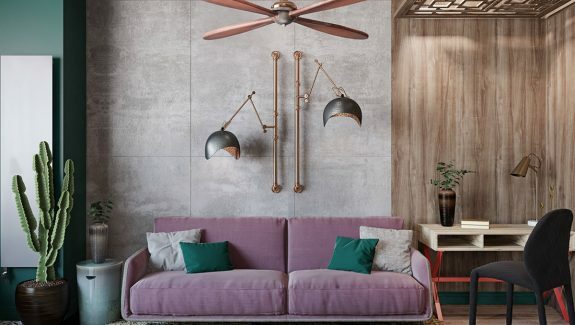 By introducing plenty of warming wood tone the interior becomes a more comfortable, homey feeling space - rather than like a cold abandoned factory. 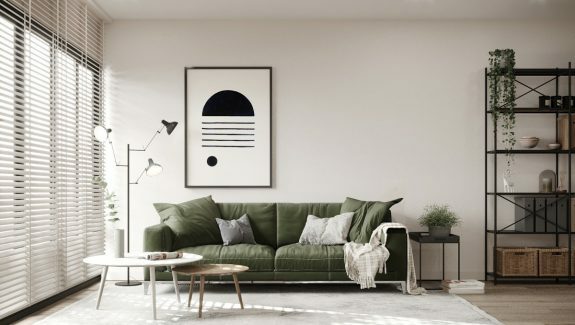 Bring in a family of lush green indoor plants and the place really starts to come alive. 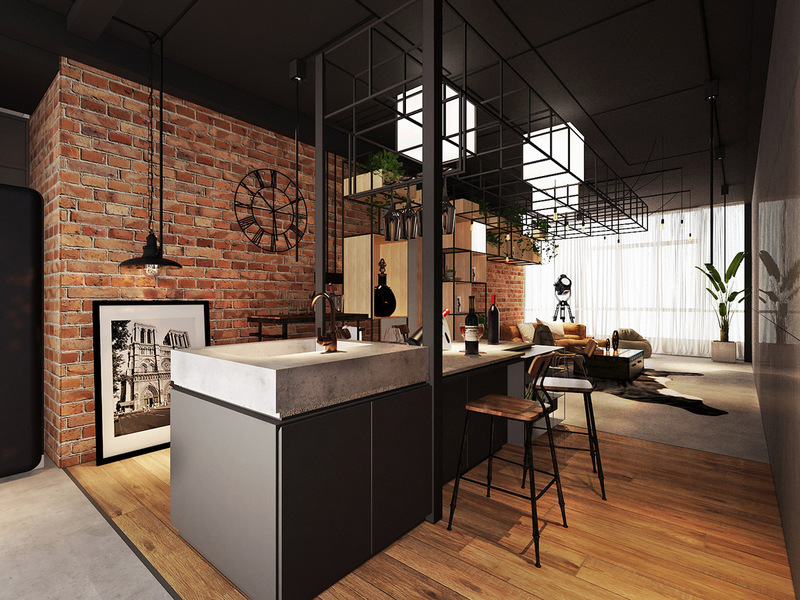 Check out these three gorgeous loft designs with industrial style, that each do ‘chic’ in their very own way. 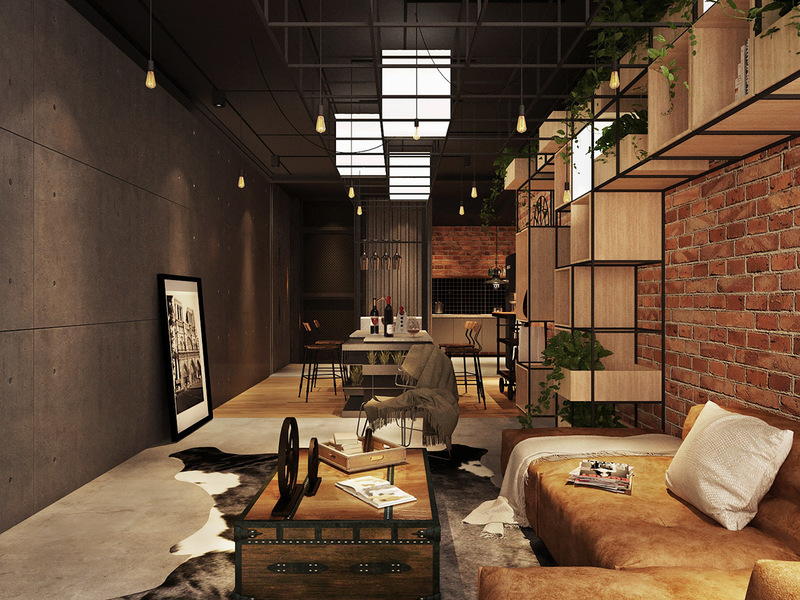 Our first industrial style loft is located in Saint-Petersburg, Russia. 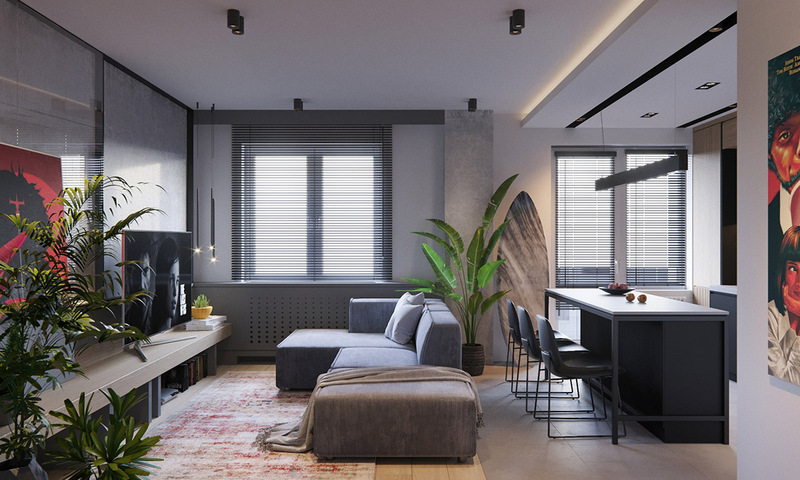 The first glance of the industrial style aesthetic in this smooth modern living room is one bare concrete window wall. The flooring beneath the sofa is wood that is mostly covered by a soft red area rug. A red movie poster matches the hue of the carpet. A large indoor plant peeps out from behind the sofa, plotting a visual divide in the living dining room combo. 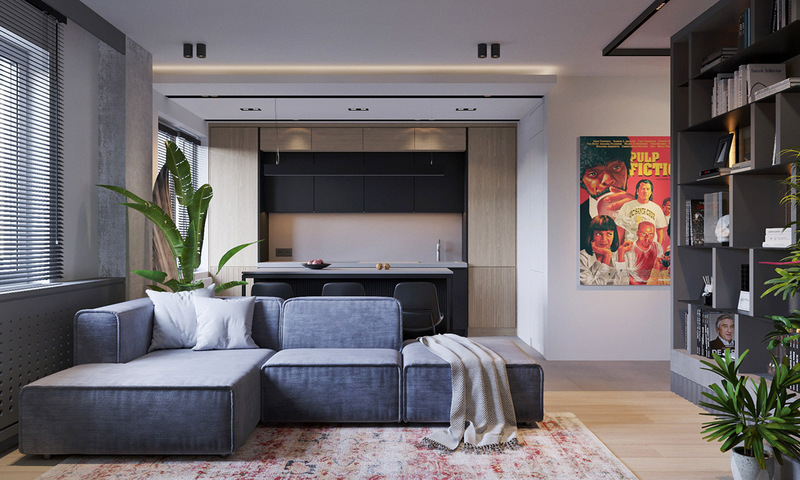 The modern sofa further divides the room, with its back firmly facing the kitchen diner. 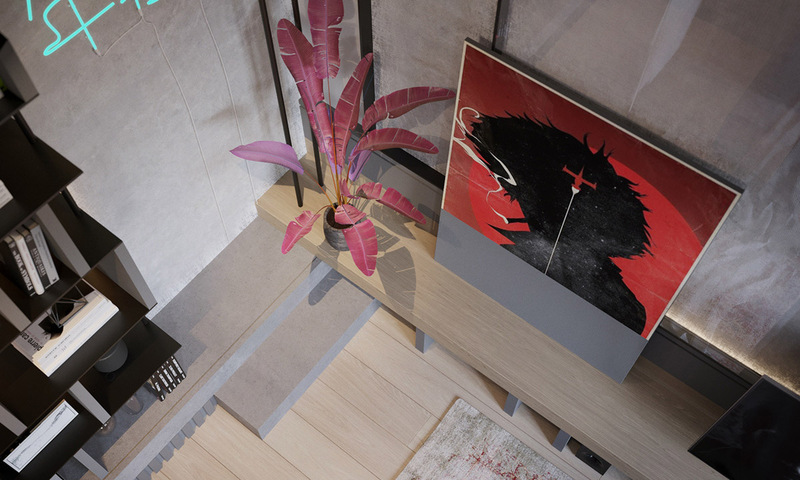 A chunky wooden slab secured on concrete struts makes a media unit opposite the sofa. 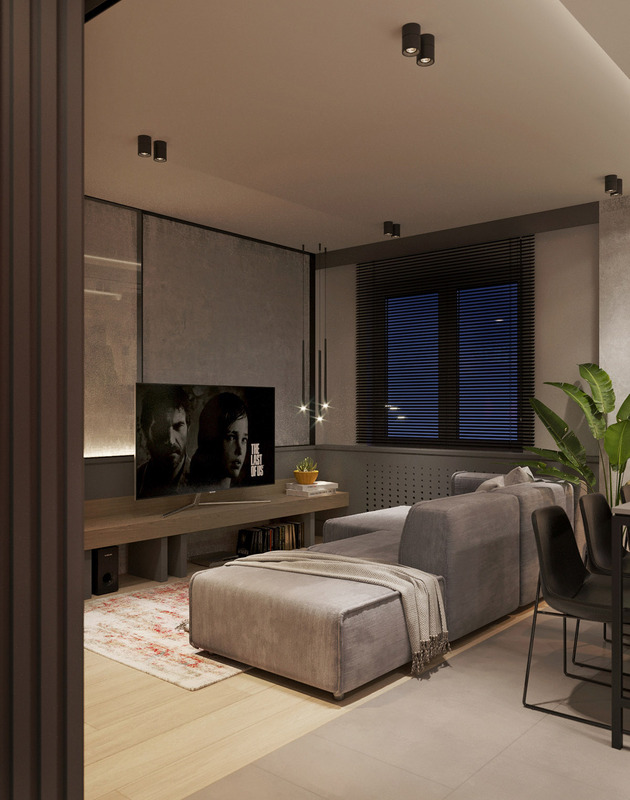 Ambient side lighting emanates from a cluster of contemporary pendant lights over one end of the tv shelf. Colourful indoor plants decorate the opposite end of the media unit. 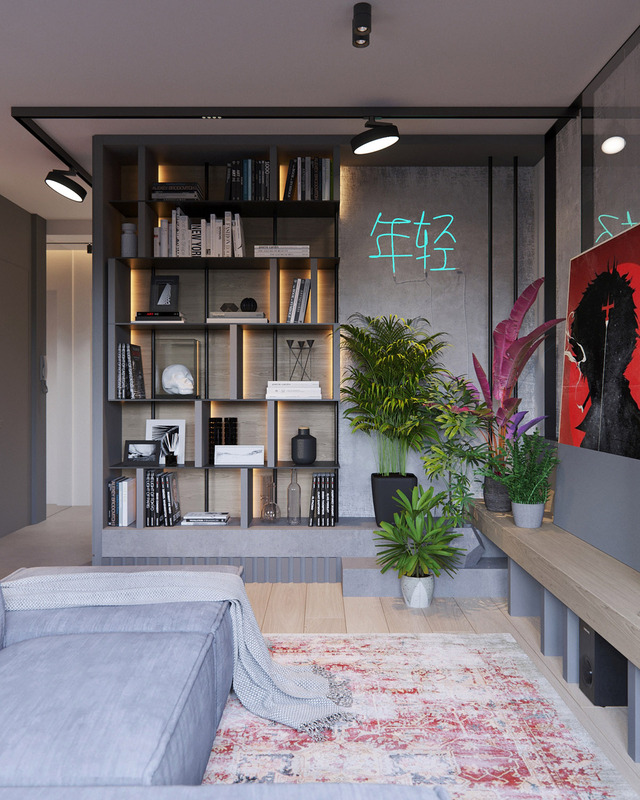 The foliage feathers the corner of the room and leads the eye around to a bespoke bookcase with LED shelf lights. The plants are raised on a set of concrete plinths off the main floor. 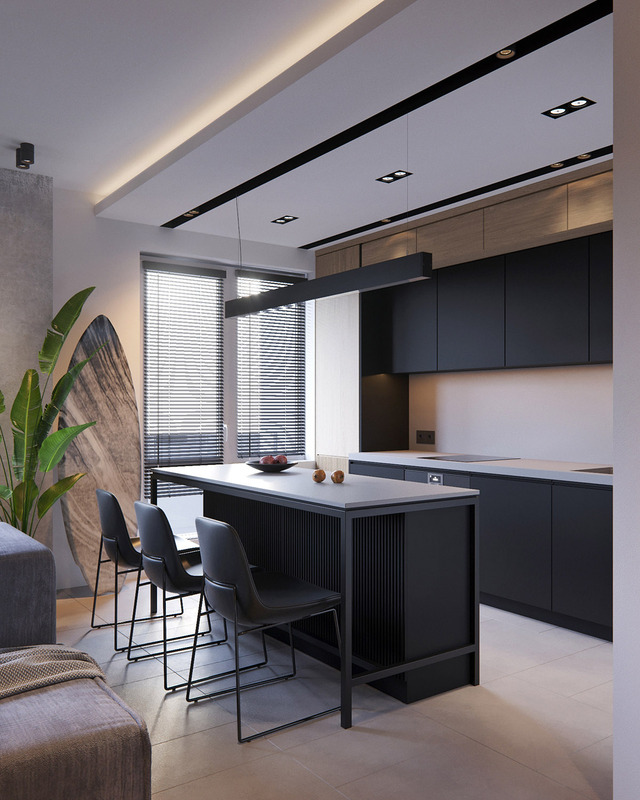 Black cabinets and light countertops make up a one wall kitchen with island. A linear suspension light hangs above the dining spot at the centre, which comfortably seats three at meal times. The home entryway leads directly into the living area, with no door in between. The track lighting runs between the two spaces with no break in the line. There is a glass closet inside the master bedroom, which puts the garments on display at all times. 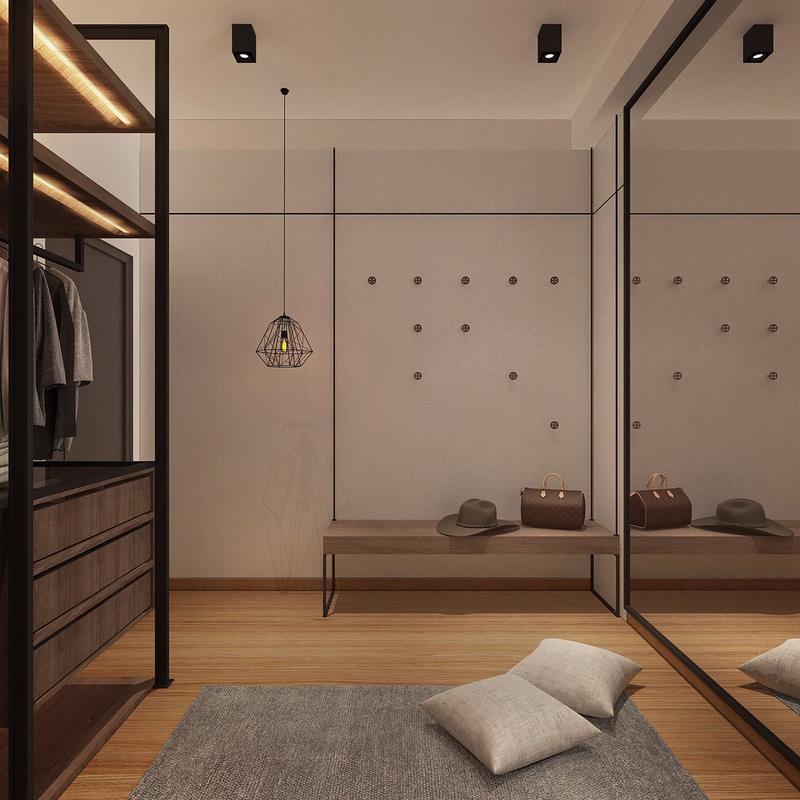 Closet lighting makes an even bigger spectacle of the wardrobe. 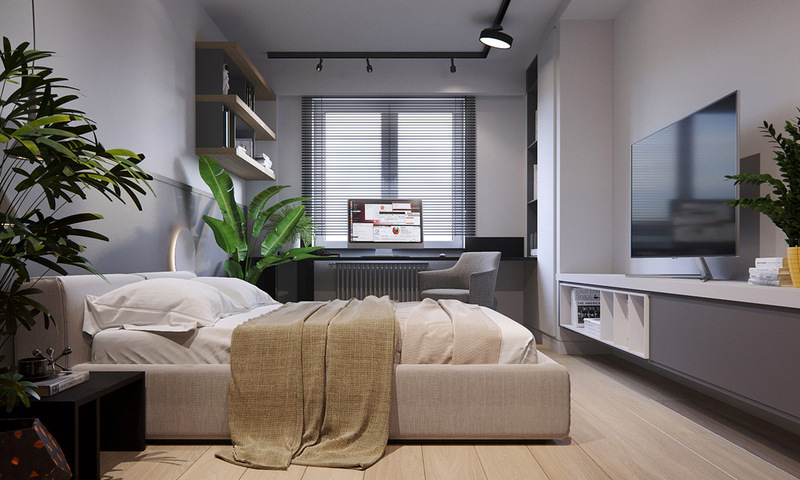 A media unit is wall mounted opposite the foot of the bed. 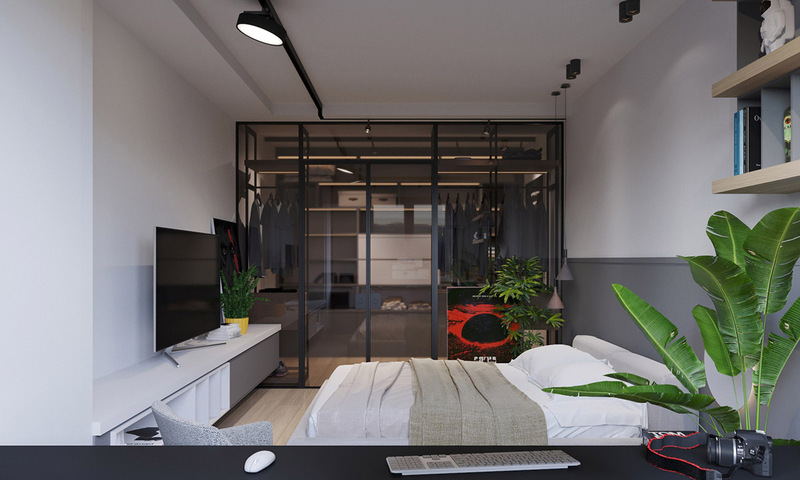 A home office area runs the length of the bedroom window wall, equipped with a fabric covered desk chair. 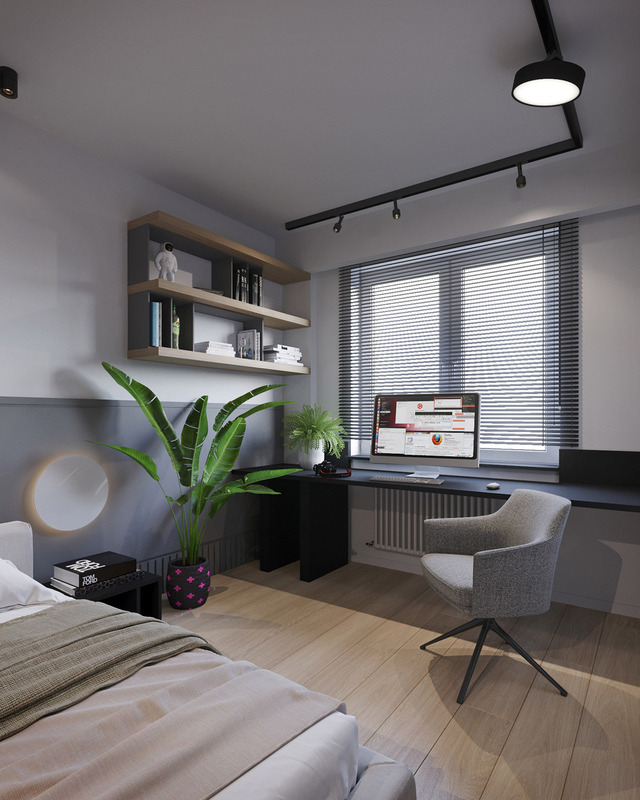 Two bedroom pendant lights illuminate a bedside unit, plus a geometric planter and poster that continue the red accent through from the living room. 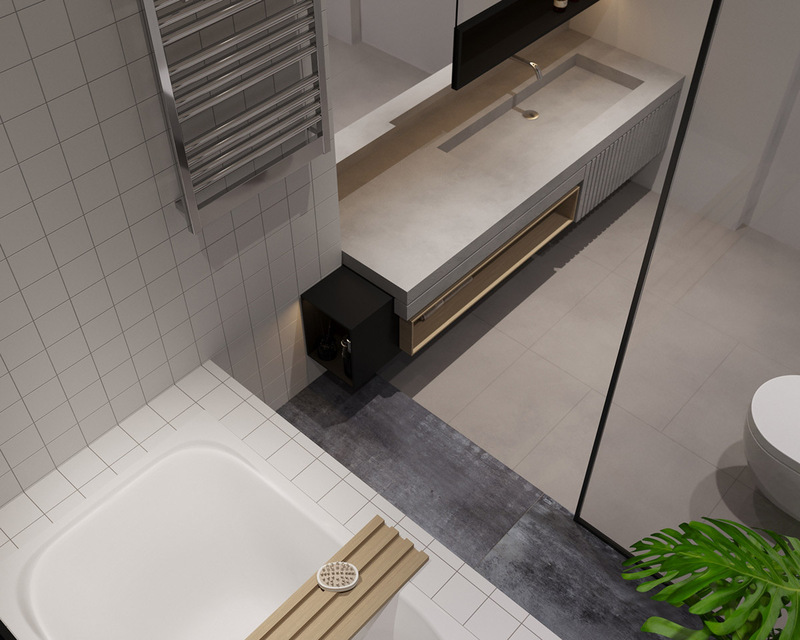 An integrated basin cuts into the countertop of a modern bathroom vanity. 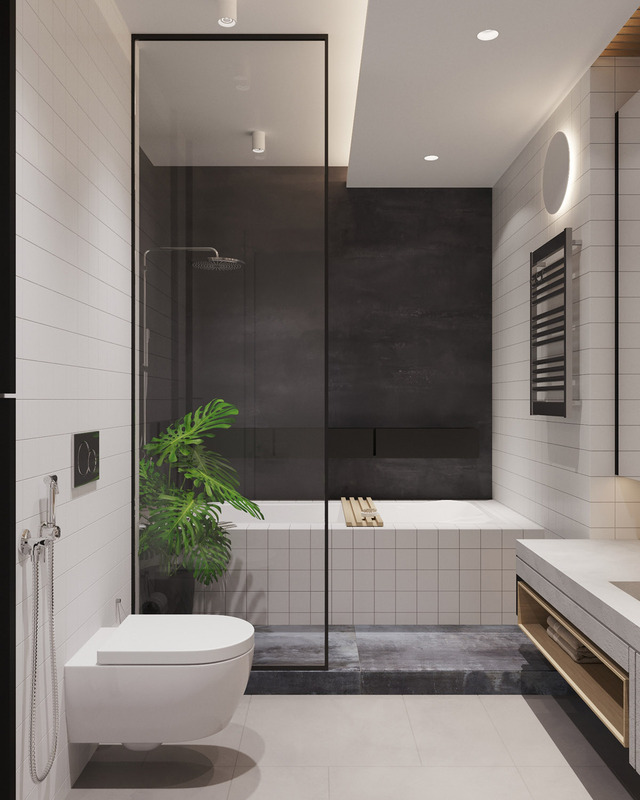 The shower screen separates off a wet area in the room that also contains a bathtub. A heated towel rail serves at the exit of the wet zone. Our second loft switches out hot red accents for cool blue decor accessories. 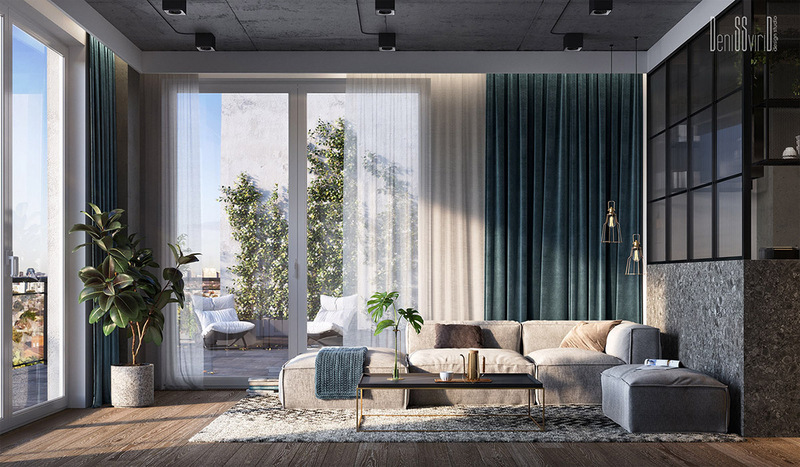 Plush blue window drapes and throws lift a pale grey living room. 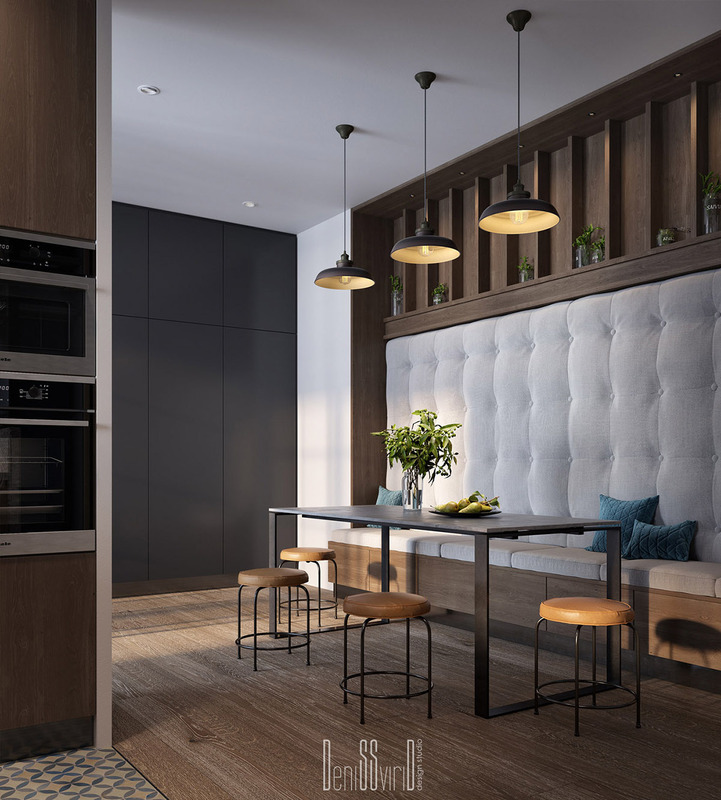 A towering banquette design is the standout feature of the kitchen diner space. A tall tufted backrest stretches up to a panel of high shallow shelves, which hold a delicate selection of herbs. Blue throw cushions dress the seat of the bench. 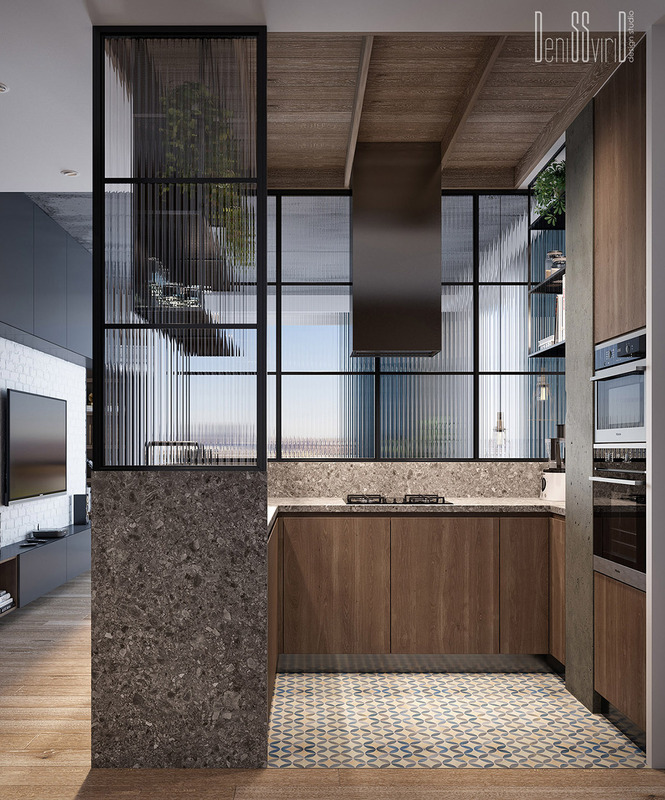 The accompanying U-shaped kitchen is obscured from the living room behind textured glass. Suspended shelves hold hanging plants, crockery and wine glasses. 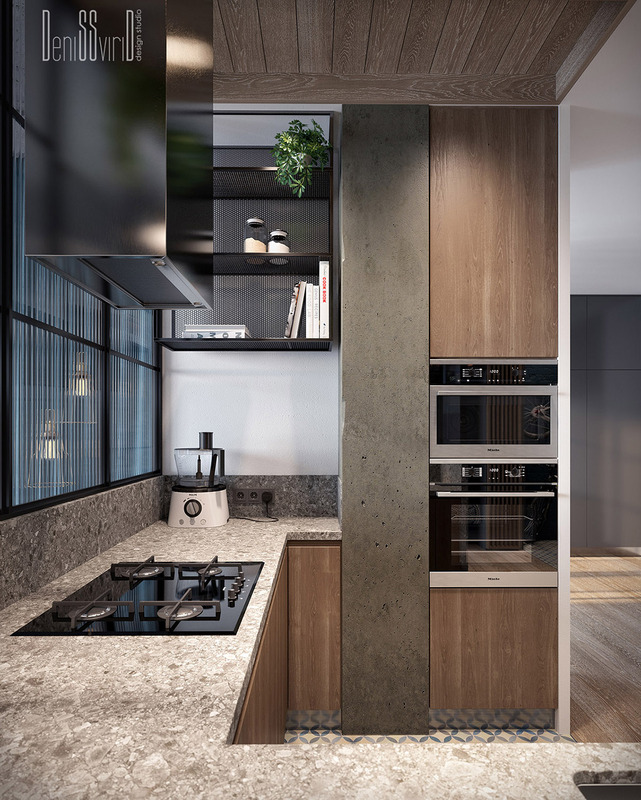 A concrete support column cuts through the arrangement of wooden cabinets. 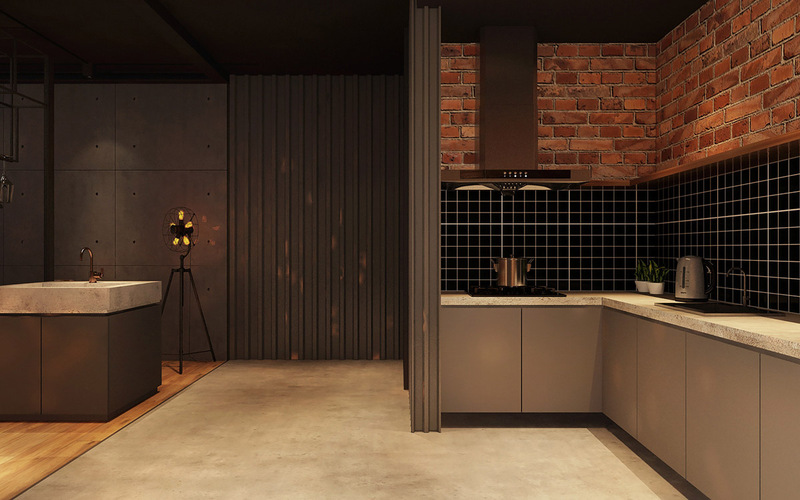 A grey granite kitchen countertop matches the tone of the bare concrete. A cool bedroom scheme has been achieved with bespoke furniture design. 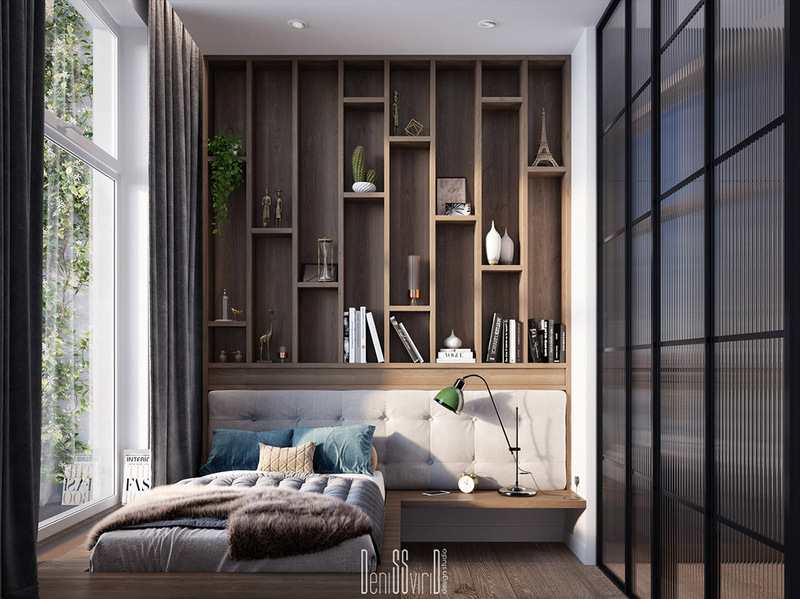 Vertical shelving cubbies decorate the headboard wall, storing books, treasured items and plants. A green bedside table lamp matches the deep green foliage. The double bed is a flush-fitted design with an asymmetrical aesthetic, which features an extended cushioned headboard and bedside shelf at just one side. 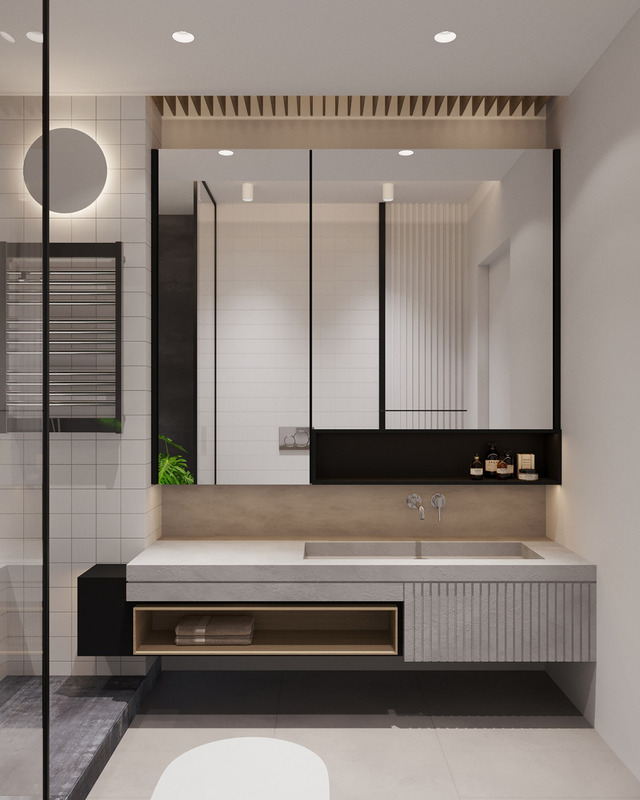 Inside the bathroom there is a unique sink with a cylindrical design; wall shelves hold some more plants above it along with obligatory toiletries. 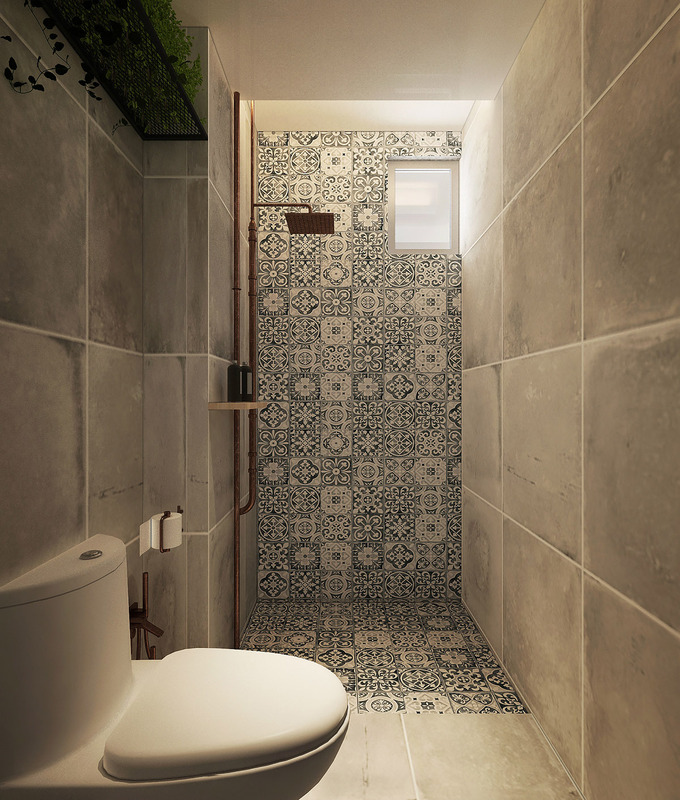 A second, smaller basin occupies wall space next to the toilet. 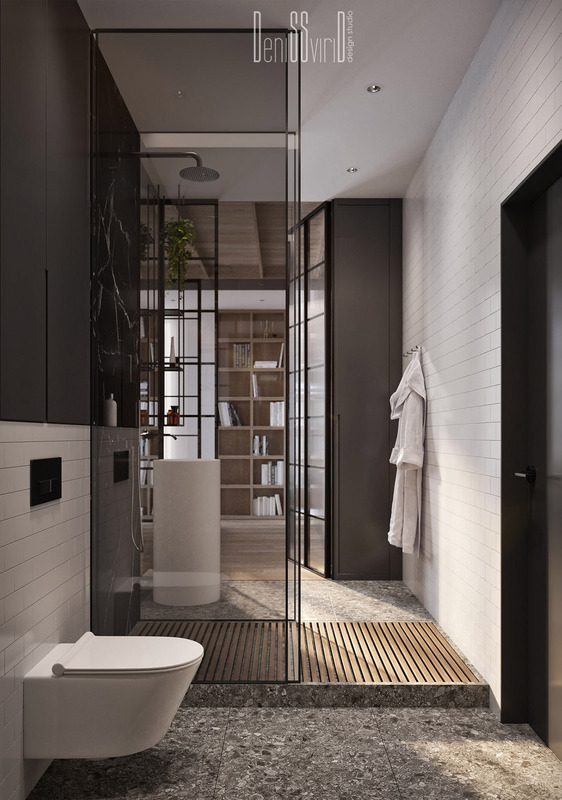 Smoked glass screens protect around the splash zone of the shower. 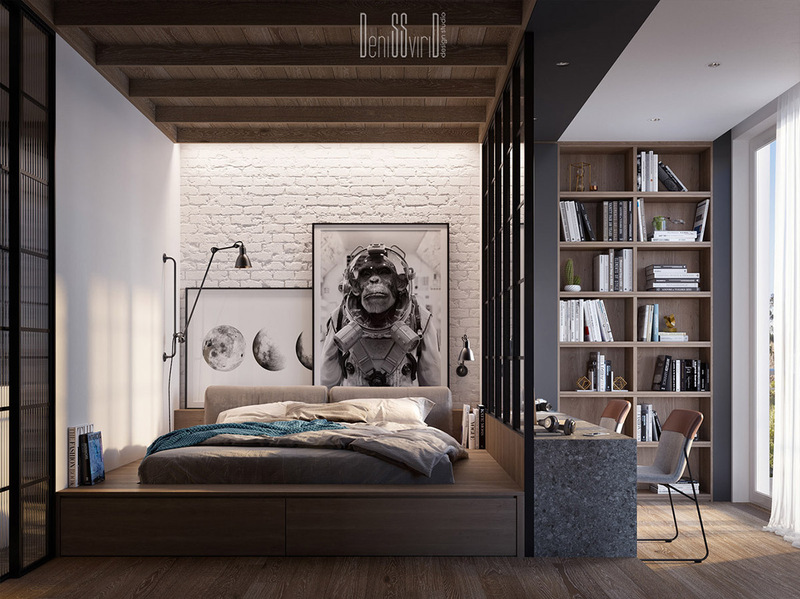 A second double bedroom holds another built-in platform bed design. 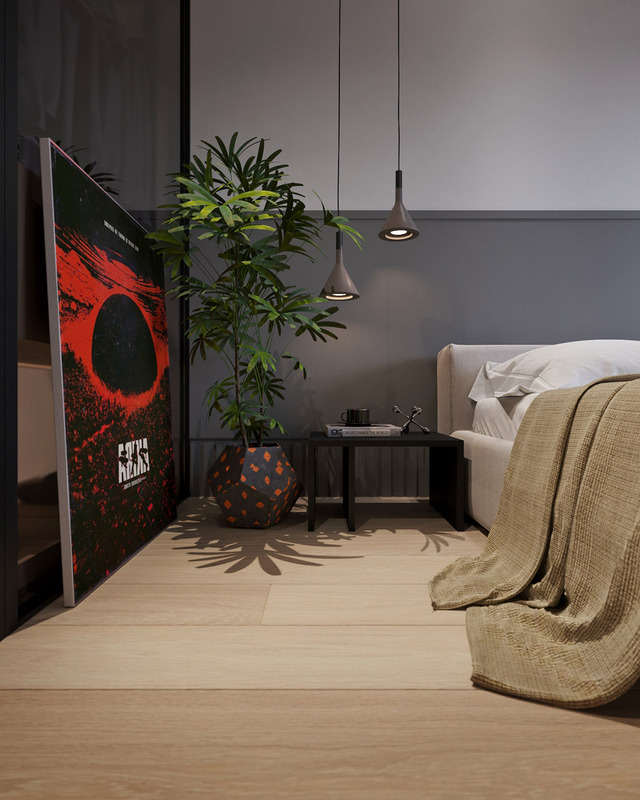 A swing arm wall lamp provides reading light up by the pillows and space themed prints decorate the headboard. 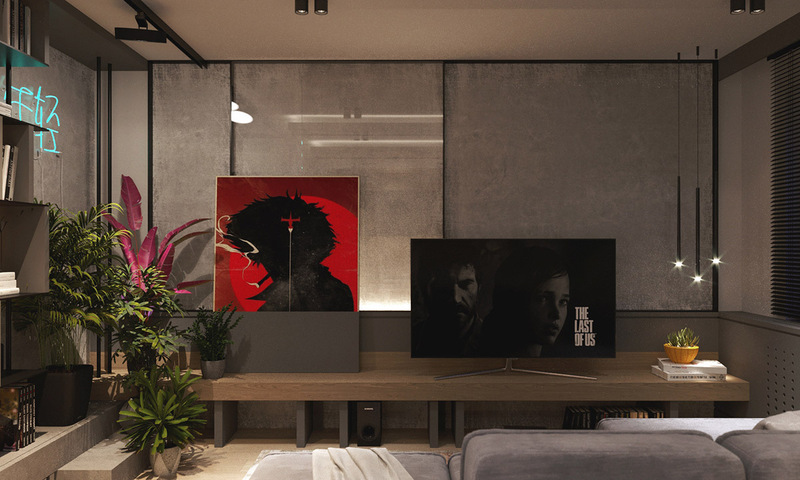 The main artwork is the Space Chimp by Maarten Verhoeven. 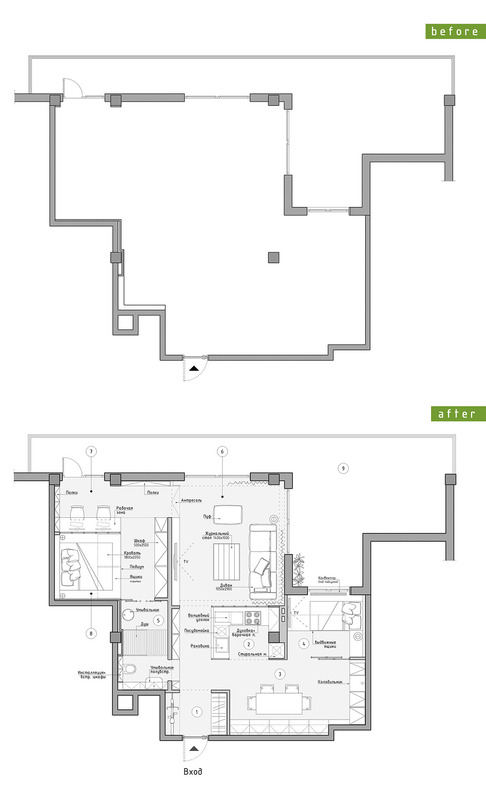 The empty apartment plan shows only the concrete support strut that is now observed in the new kitchen. 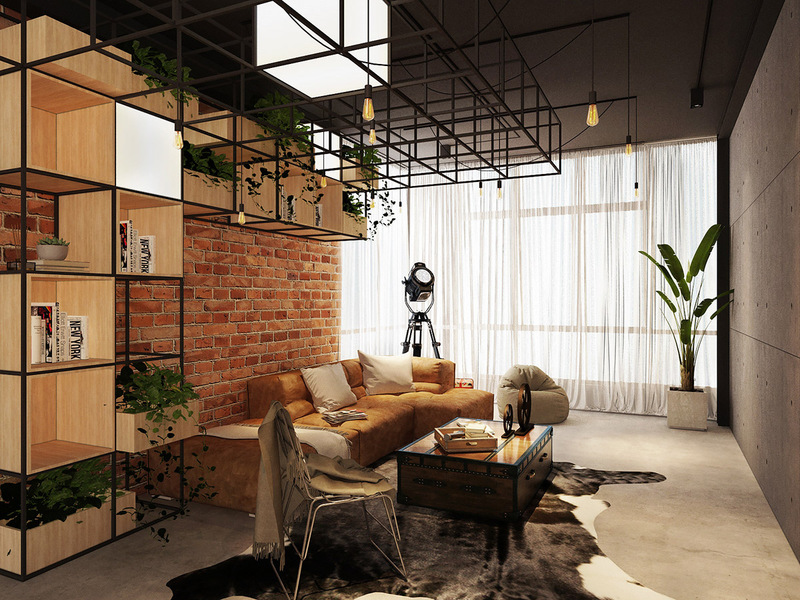 Our third industrial living space is dominated by a black framed storage system that forms a canopy over the sofa. 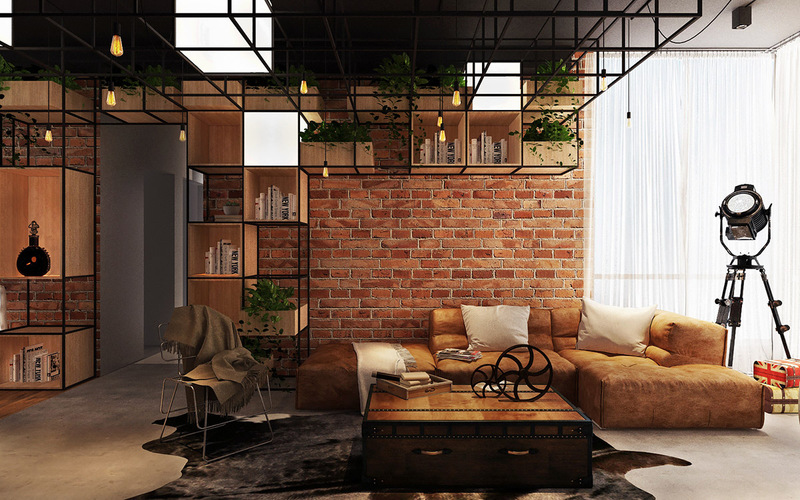 The bare industrial home decor is warmed by the golden hues of the furniture. 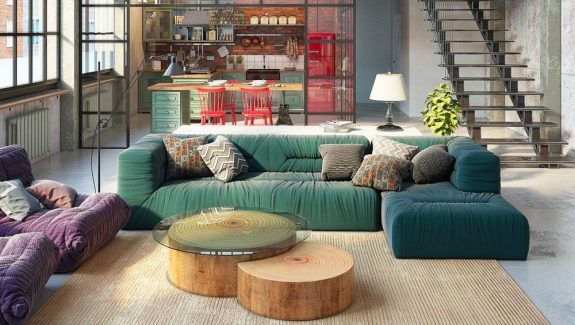 In front of the sofa, a unique coffee table sits on top of an animal hide rug. 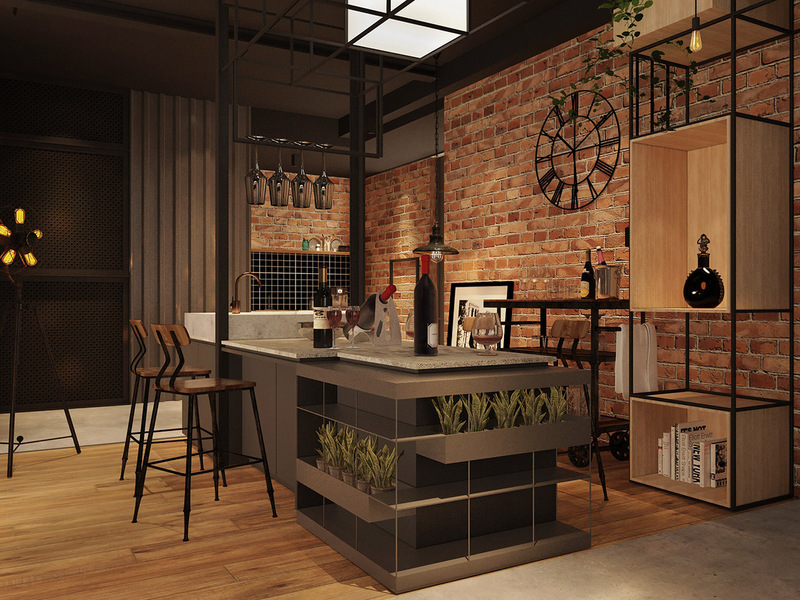 An industrial style dining space and kitchen reside in the same open plan space as the lounge. 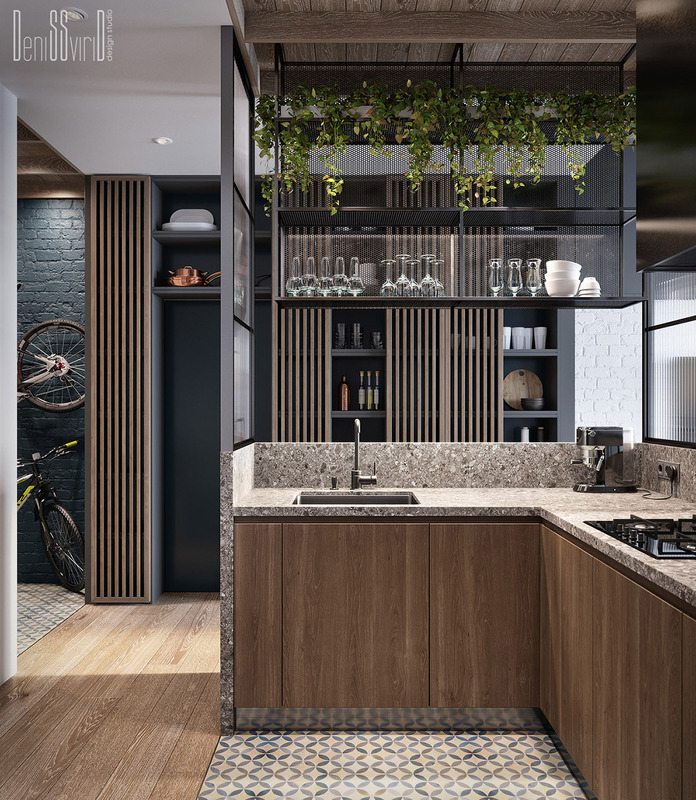 Herb planters add visual interest at the end of a central kitchen island that helps zone the space. A large wall clock ties in with the black metal framework of the home’s bespoke storage system. The storage frame joins the lounge with the kitchen. Concrete countertops are matched by a solid concrete kitchen sink. A brass faucet warms the look. 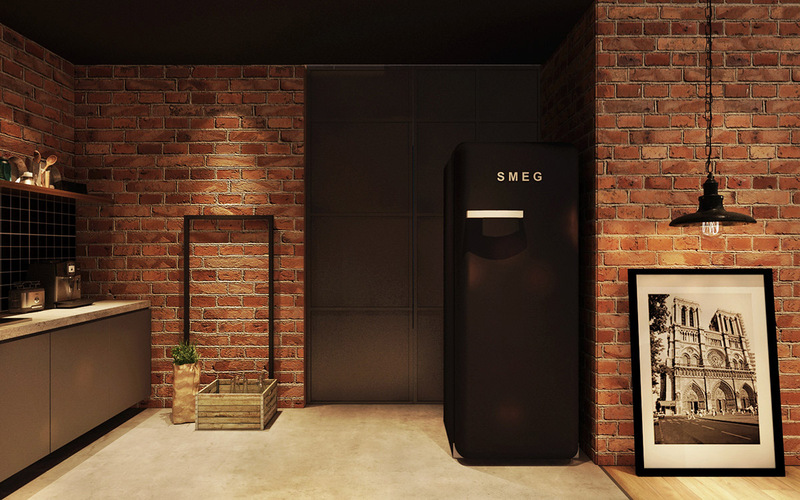 A black refrigerator blends in with a black backdrop. 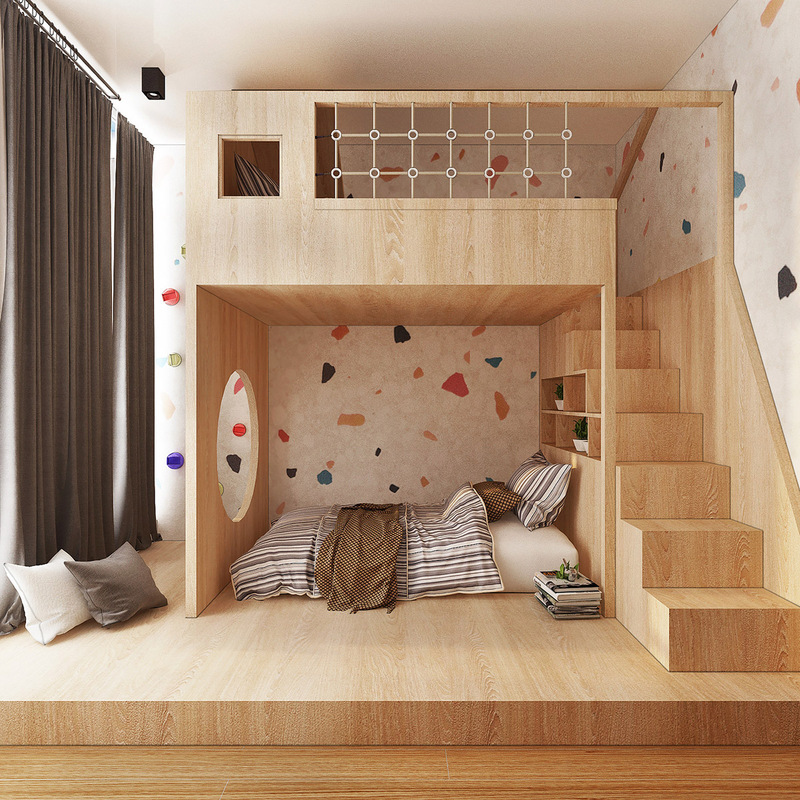 The child’s room is a brighter affair, with multi coloured pattern behind the kids’ beds. 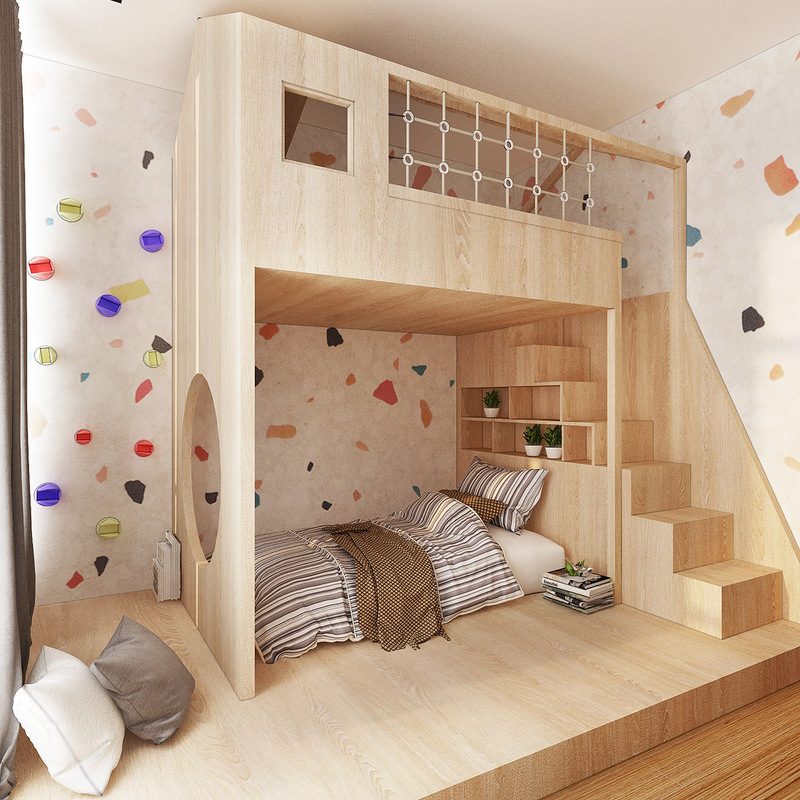 A column of colourful climbing wall grips scale the wall to the top bunk. 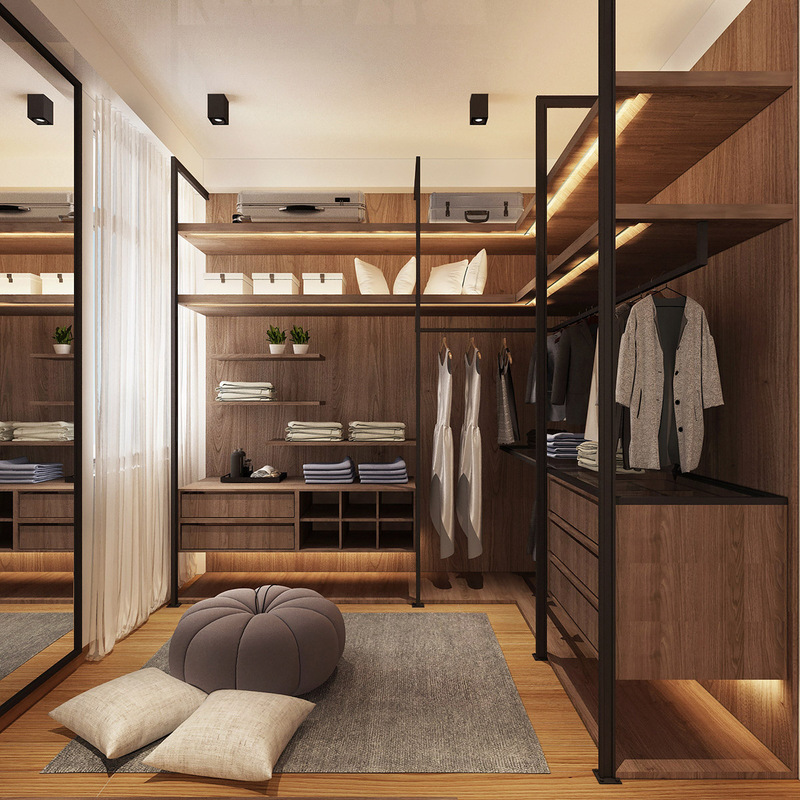 Luxury closet systems in wood and metal fill a walk-in wardrobe. 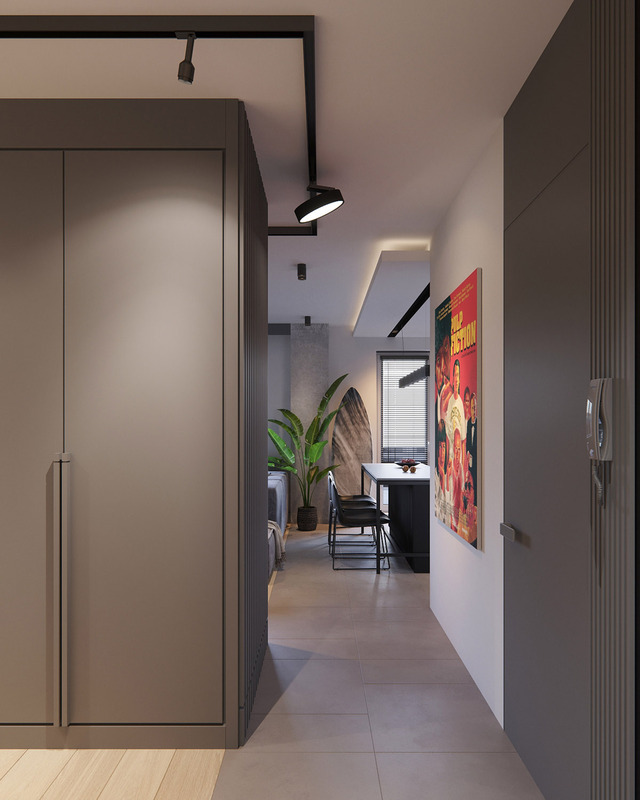 Decorative wall hooks are poised to hold more accessories at one end of the closet, with industrial style lighting showing the way. Behind the lounge there is a small bathroom. A round mirror on a leather strap serves a drum pedestal basin. 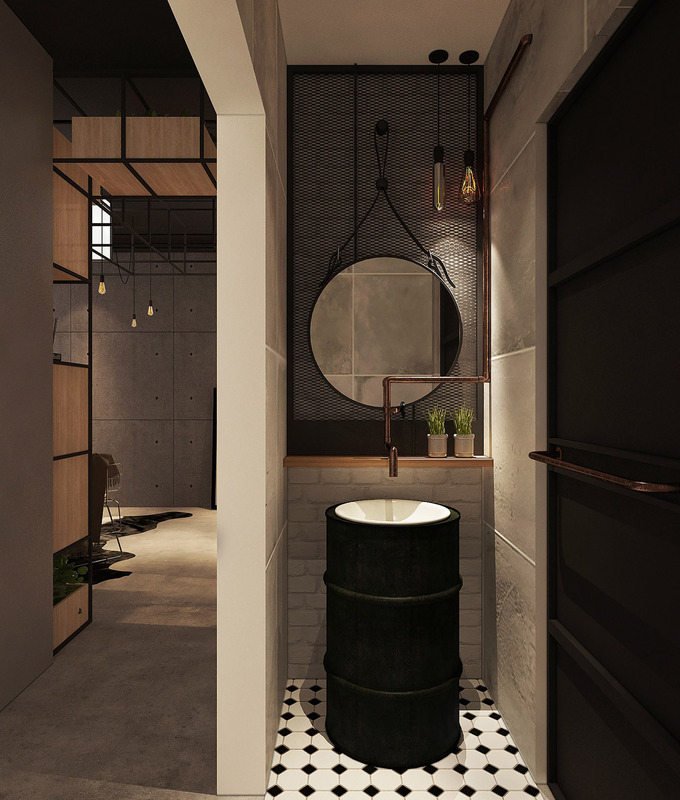 Copper pipe forms an industrial style faucet and towel rail. 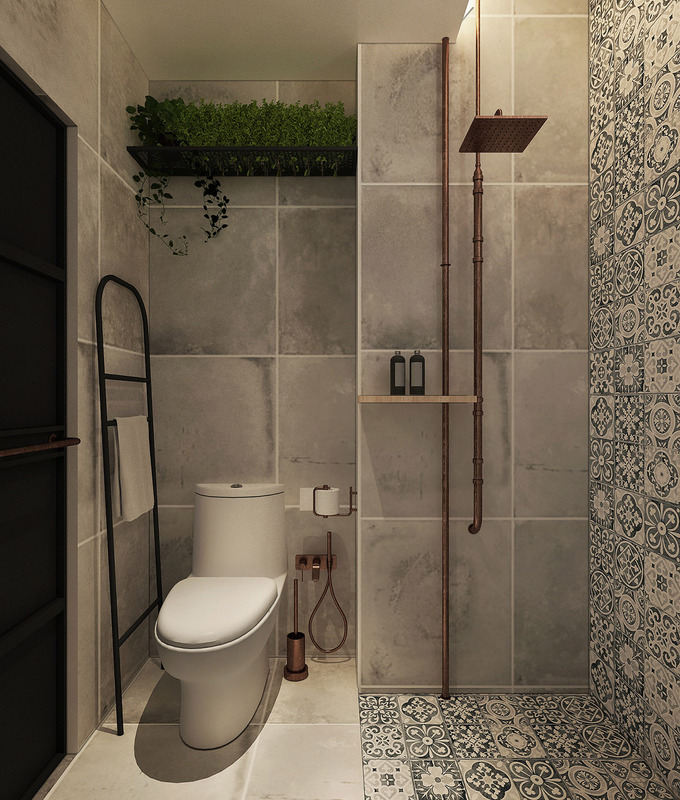 The shower design follows the copper pipe theme. 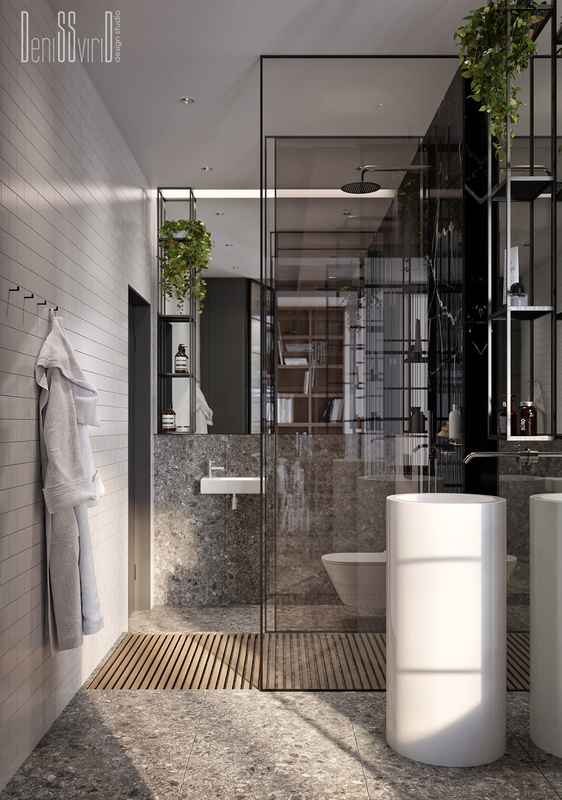 A shelf of green plants bring life to the compact industrial bathroom.